Air Cavalry can dominate future land warfare. Unfortunately, the US military focuses on ever larger, more expensive, and more powerful attack helicopters. 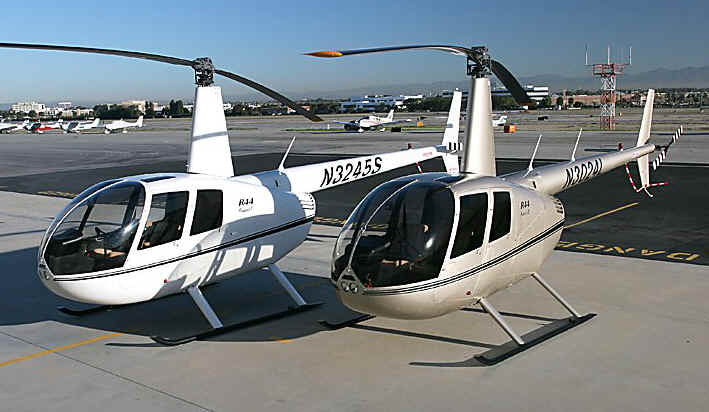 Meanwhile, civilian aviation has developed small, inexpensive helicopters like the Robinson R44 series that cost just ~$400,000 retail! These packages are interchangeable so a unit can tailor its firepower to match its opponent. 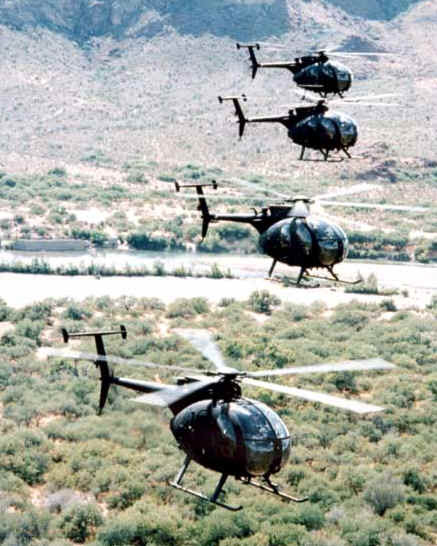 Close-in fighting will be done by these "disposable" helicopters like the Robinson R44, fighting in large groups like the larger "Little Birds" shown above. Dozens can swarm in and destroy an armored unit in minutes. A small, agile helicopter with little heat signature will be difficult to hit. Most importantly, these helicopters cost less than some spare parts for today's attack helos. An army must develop tactics to coordinate dozens of helicopters swarming onto an enemy force. Of course a soldier flying an unarmored helicopter around the battlefield is vulnerable, but less vulnerable than a soldier running across a field with 50 pounds of gear. In large attacks, AirCav may join with larger helicopters as swarms of small helos engage the enemy while Apaches watch from a safe distance and engage targets of opportunity. The Hellfire-equipped horses charge, select targets, and slow around 2000 meters away to engage, while the .50cal/40mm gun horses fly closer with evasive maneuvers to draw and exchange gunfire. They will take and inflict casualties, while they distract anti-aircraft gunners from the larger AH-64s unleashing missiles from thousands of meters away. If enemy air defenses are formidable, RAH-60s may fire Hellfire-size rockets from a safe distance to saturate the area just prior to the attack. After the armored force is devastated and in chaos, RAH-60 "Gunhawks" appear high overhead to saturate the area with direct downward fire to "mop up" infantrymen. As enemy soldiers abandon their vehicles, the horses move in for a turkey shoot. UH-60Ms control operations from a safe distance while supporting EH-60s jam and fire Sidearm missiles at enemy radar. HH-60L Medevacs arrive after the fighting has slowed. UH-60Ms may help medevac or external sling damaged horses back to base. This will not result is a clean victory because a capable enemy will shoot down lots of cavalrymen before their armored vehicles are destroyed. However, cheap helicopters are a small price to instantly destroy an armored unit. After the enemy is mostly destroyed, aircav can return to base and rearm for another engagement. Most opponents will surrender, but some fanatical units may put up a fight. In such cases, infantry take over the nasty task of mopping up. 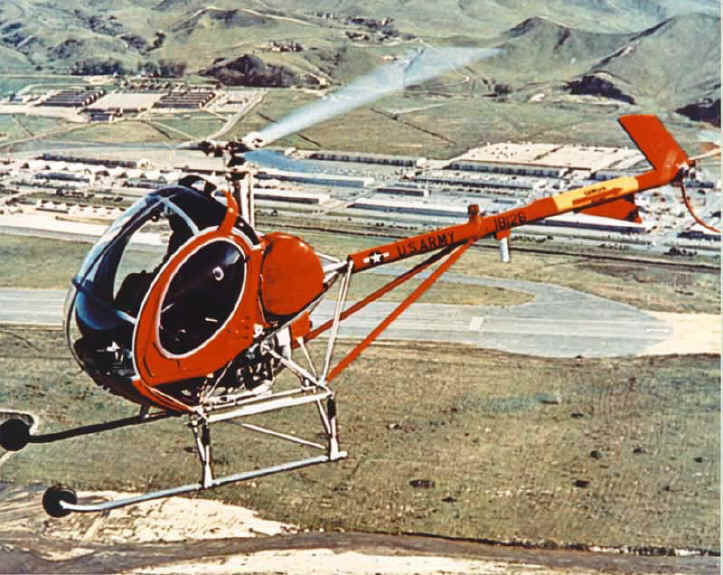 This is not a futuristic concept, all the equipment is available today and three dozen tiny attack helos cost less than an Apache helicopter. It's time to give each cavalryman his own flying horse and charge into the 21st Century.